Cook2Cook: What a Croque, Monsieur! When I was in high school, I was enamored with the French language. So much so, that I took four years of French, went to Paris, and to this day continue to read and practice the language - badly. In fact, my French friends have often told me that I can bastardize the language like few people they know. Now that's quite a compliment, since to most Parisians, at least, just about everyone but a Parisian defiles the language. So, to be in the hall of fame of people who cannot pronounce French is quite an accomplishment! At least I standout for something notable with the français. 1/2 pound sliced sweet Serrano ham (Make sure you get the sweet Serrano, and not the salty type. It makes a HUGE difference to the taste of the end product and you will have a crock monsiuer on your hands if you use the wrong ham.) If you cannot find sweet Serrano ham in your area, use a sweet ham. In this version, I use more Gruyère cheese than is usually called for in the recipe. I like a thick sauce to apply to the bread, and it melts very well on the grill. 3/4 cup Gruyère or Swiss cheese. You can either grate the cheese or tear the slices up into small pieces. 1 cup warm milk - As soon as you see bubbles forming around the sides of the pan in which you're warming the milk, it's time to take it off the fire. 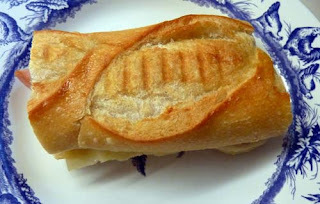 You can make this sandwich in a panini grill or by using your stovetop and broiler. Begin by heating up your panini grill to 300 degrees or medium high heat, or preheating your broiler, if you're going to prepare your croque by way of stovetop. If you can invest in a panini grill and love toasted sandwiches, it's the way to go. For me, the stovetop method is just not as convenient as the grill. For the sauce, begin by melting the butter in a medium sized pan over medium-high heat until it's just hot. 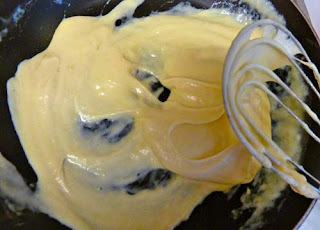 Then add the flour and stir until the roux is a light yellow, careful not to let it get brown. About 1 minute. It will also have a nutty aroma. Next, slowly begin to whisk in the warm milk, stirring constantly, until the sauce thickens and comes to a boil. Reduce to low heat, so the sauce simmers and add the nutmeg, salt and pepper. Allow the sauce to simmer for another 2 to 3 minutes. Continue to stir. Now you're ready to add your cheese. Mix in your cheese until melted. Set the sauce aside. Cut the baguette into approximately six equal pieces and slice open each one, leaving a hinge. Here is where there is a difference in the way the sandwich is put together, depending on whether you're using a grill or the stovetop. Open up the bread and spread the Mornay Sauce on both sides. Place 1 slice of cheese on each side of the bread, over the Mornay sauce. 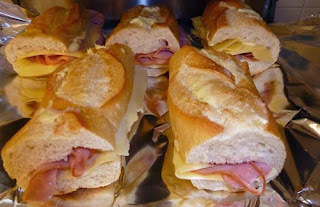 Place 3 to 4 slices of the sweet Serrano ham in the middle of the sandwich. Close the sandwich. Before beginning to grill, slather on soft or melted butter on the tops and bottoms of the sandwiches. Winslow Dog's Notes: The reason you want to put the cheese on the outside of the sandwich closest to the bread, and not in the middle is that if you have a panini press which heats on both the top and bottom sides, then your cheese will melt better as it is closest to the heating source. If your grill heats only on the top, then you'll want to turn the sandwich. That is a tip that has helped me avoid the "cold hard cheese in the middle" trap. Place the sandwiches on the grill. Leave to grill for about 4 minutes or until the bread is crispy and the cheese is melted. Remove the sandwiches from the grill and serve immediately. Prepare the sandwiches the same as above, except do not apply the Mornay sauce to the inside of the bread. In a heavy skillet melt 1 tablespoon of butter on low heat. When hot, add one sandwich at a time and cook until a the bread is golden brown, about 2 minutes. Then flip the sandwich and repeat with the other side. Move the sandwich to a baking sheet. Do the remaining sandwiches the same way. When all the sandwiches been cooked on the stovetop, spoon on the Mornay sauce over the sandwiches and, if you like, add grated Gruyère cheese to the top. Place the baking sheet in the broiler until brown, about 1 to 2 minutes depending on the broiler. Keep an eye on it though! You'd hate it to burn it at this stage!! For the stovetop version, it may be easier to eat, if you use slices of bread instead of a baguette for the sandwich, but the taste will be affected. Now, that's a Crunchy Mister!